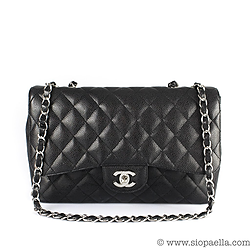 Siopaella Designer Exchange - Blog Siopaella Designer Exchange - Blog – tagged "bags"
Gabrielle (Coco) Chanel herself designed the bag in February 1955. This being the 2nd month of the year '55 hence the name 2.55. 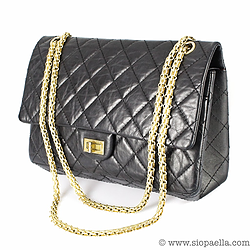 The bag is comprised of a leather which has a worn appearance and the chain strap is a jewellery like chain. 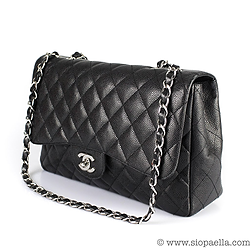 Most notable is the bags lock, a rectangular twist lock known as the mademoiselle lock. .
Black classic flap in quilted durable caviar leather. Then in 2005 Largerfeld redesigned the 2.55 (which was then the classic flap) to commerate 50 years and it featured once more the original mademoiselle lock and jewelry chain Coco had originally designed. This has become to be know as the 2.55 Reissue. 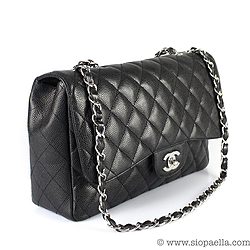 Chanel black leather 2.55 Reissue handbag Double flap with mademoiselle twist lock closure. 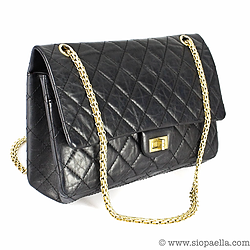 Technically, the name Reissue would only be associated with a bag that was produced after the original. However, the 2.55 bags with the mademoiselle locks have come to be known as The Reissue and bags with the interlocking CC are known as The Classic Flap, but both bags are the 2.55. Hope that has cleared up any confusion on the most coveted bag!